In addition to topics from the tourism & cruise and bike & outdoor, especially the area camping & caravanning is strongly represented. All well-known brands are on site and present the novelties of the model year 2019 - from the van to the liner. Compared to previous years, the number of accessories and technical areas has increased significantly. Whether awning or new heating system: the exhibitors have the right products on site. 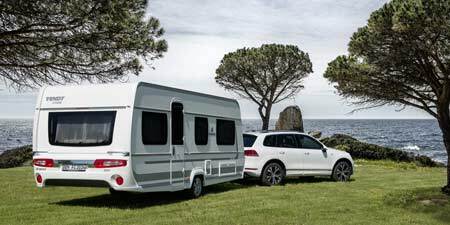 The offer is rounded up by consultations for self-builders and year-round campers - not at least thanks to attractive presentations of numerous campsites and destinations. Included in the program: countless tourist offers. Tour operators and holiday regions, shipping companies and wellness hotels - they all present their offers in the Leipzig exhibition halls. Individual travelers and families, package holidaymakers and weekend travelers get their money's worth at the fair. Even those who are "only" looking for the right equipment will find it here. Renowned manufacturers and dealers present themselves in the two-wheeler sector and offer their products for extensive testing. Experience the variety around tourism, caravanning, outdoor and culinary. That is why we also offer you a varied program on our stages. With lots of information and fun, presented by TV presenter Ingo Dubinski. On the stage "Touristik & Caravaning" you will receive lectures about traveling all over the world. Let yourself be abducted to Bali, Morocco, Costa Rica or Vietnam. Or discover extreme climbing with Thomas Huber, one of the Huberbuam who will be on the TC stage on two days, Wednesday and Friday. His topic: "With the courage to succeed". We look forward to the presentation of our project work during TC Touristik and Caravaning from November 21 to 25 in Leipzig as a part of the stage program in Hall 2, Booth 2K30. Take advantage of the project presentation at our booth in hall 2, 2G43 - alaturka.info / camper-route.de. As part of our project to develop gentle camper and outdoor tourism in the Balkans, the "timidity" of many a traveler was shown to be choosing the Balkan route on their way south. This was the decisive criterion for us to develop a partially guided camper tour through Albania, Macedonia and Greece within the framework of the project work, which should include historically interesting cultural assets as well as the activities of hiking and cycling, so that the contact to the respective population develops and the journey in the South can also lead on the way to a stopover lasting several days (topic overwintering in the south). During CMT in Stuttgart, we had the opportunity to point out the project work at the booth of our sponsor Fendt-Caravan as well as at the booth of partner country Albania for the first time and thus to promote the partly guided camper cultural journey. The interest in Albania was particularly great, so that a first part-guided cultural trip could take place in April 2017. We also participate in the stage program of TC Leipzig. The TC stage is located in Hall 2 (Stand 2K30).